Before Recovery Café Community Members break bread together, they are asked to acknowledge acts of kindness that inspire them. Interrupting the prolonged silence that follows this request while individuals search their mental rolodex of good deeds, a Member recognized Mr. Michael “Mike” Perry for his regular volunteer service of setting up the buffet and tableware for each midday meal. The applause swelled and all eyes turned to Michael as he walked back to kitchen with a shy smile, content merely to help keep the Café’s daily operations running smoothly. “I’ve been told to look out for myself more than others,” he said, “but that is a real struggle because most of my life I’ve never felt like I was worth anything.” Michael’s deeply held ethos is that his needs will be met in the process of serving others. In fact, Michael claims the routine of his 35-hour volunteer week at the Café keeps him sane, purposeful and on the right track to recovery. 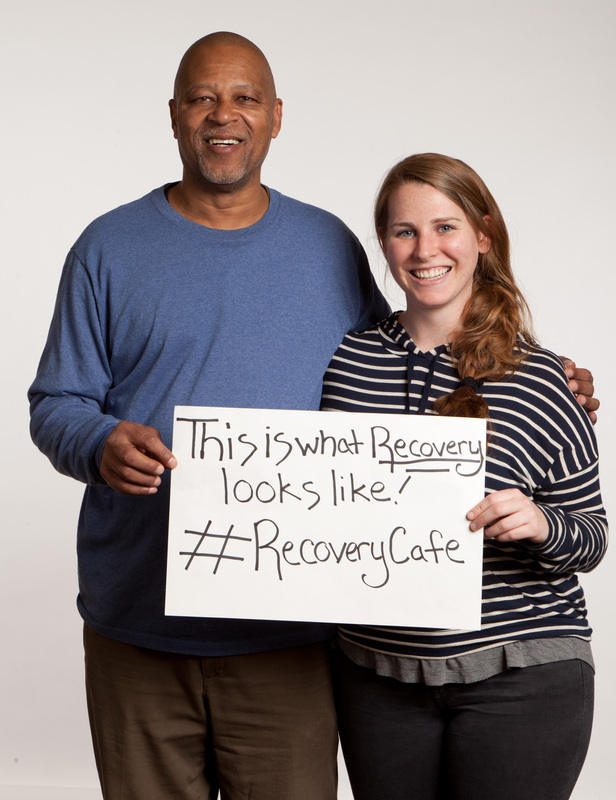 “I always have to have something that’s steady,” said Michael, “and someplace that is safe.” Recovery Café is the safest place he knows. Michael has been a Member on and off since 2009, faithfully following the Café as it changed locations several times to expand its services and physical space. He regularly attended 12-step meetings at the Café to counter his substance abuse relapse and take steps toward establishing a healthy lifestyle, but in 2015 Michael became homeless. Feeling defeated and alone, he found his way back to our doors. I don’t know how it came to be that I ended up here one day, but I was determined to get through this. I lost all hope, and I never thought I would make it back after that relapse. Every single thought and dollar was spent on being high again. I was still homeless, but I regularly came to the Café and after a few months I realized I was home. Michael’s long journey from substance abuse to recovery began when he was a teenager, trying to fit in and be fully acknowledged by his peers. My journey started as a fun thing. Experimenting with drugs was something that most of the neighborhood kids did, but it got really bad when I started dabbling into crack-cocaine. Everything that came with it – the lying, the stealing, and the cheating just to keep the high going. My drug and alcohol issues span about 30 years. It’s been a ride. After years of becoming comfortable with a predictable routine of abusing and selling cocaine, a sudden realization that he was harming to his loved ones caused Michael to confront his addiction and attempt reformation. However, he endured many unsuccessful attempts to become clean on his own. “Hurting the people I love and who trusted me – that’s the hardest part about relapsing,” said Michael. His constant setbacks to sobriety led to intense feelings of shame and embarrassment. Left untreated, those feelings eventually developed into major depression. When Michael finally sought help for his deteriorating mental state, he was hospitalized for eight days – when released, he started attending 12-step meetings. I kind of got back on track with the 12-step meetings, but the meetings didn’t do much for the depression. That led to another relapse in 2009, which got me back into outpatient treatment. That got me back on track, but at that point in my recovery, I no longer wanted to be clean and sober. Michael recalls that his last relapse occurred in 2010, during which, he was diagnosed with Type 2 Diabetes and blood clots that required swift medical attention. Michael continued to abuse drugs throughout his treatments, but during a routine checkup his physician found a softball sized malignant tumor in his stomach. Michael was devastated. After treatment was unsuccessful in eradicating his cancer, Michael prepared for surgery to remove the tumor. I was released from the hospital, but I was back again fighting the infection. They stressed having a positive attitude, and that’s not hard for me because I’m a jokester – I like to laugh, joke, and make people happy. In 2012, Michael lost so much weight from the surgery and subsequent infections that it reversed his diabetes. Yet, he continued to avoid cessation programs and continued using drugs. “I wasn’t willing to give up my will,” said Michael. In 2015 something clicked and Michael became an active, exemplary Member at the Café by volunteering and being a regular optimistic and presence around Members and Staff alike. He continues to win the battle against addiction, but fully understands that he cannot neglect his mental health. “If I don’t take care of my mental state, [the addictions] surface,” said Michael. These days Michael looks forward to a long, fulfilling future. “On March 10th, I saw my cancer doctor for the last time and I have been cancer free for three years,” Michael said, proudly. At one time he lamented quitting his odd-jobs to focus on his failing health, but Michael’s renewed aspiration is to obtain a commercial driver’s license by completing the rigorous training program at a Big Rig Truck Driving School. I want to drive big-rig in the next two months and I hope to enroll in school pretty soon. My goal is to work for the next the 10 years or more. And I know that if I’m driving I’m doing something that I love.